The exploitation masterpiece INVASION USA begins when a mysterious stranger (Academy Award ® nominee Dan O’Herlihy) engages a diverse group of Manhattan bar patrons in a discussion on the best way to beat Communism. Suddenly, a real Red Alert is declared and enemy parachutists by the thousands begin landing on American soil! Soon atom bombs are dropping, skyscrapers are crumbling and fifth columnists are taking over key industries. Through it all, a suave, street-smart reporter (Gerald Mohr) and a beautiful debutante (Peggie Castle) desperately try to find time for romance amid the chaos. 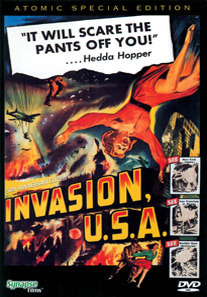 The producers of INVASION USA – a motion picture made during the height of the Cold War – dared to show audiences what World War III might look like. By making ingenious use of stock footage, models and other special effects, the filmmakers created a film that makes for an indelible viewing experience. On DVD for the first time in a digital master from a beautiful 35mm print, this is pop culture at its most explosive!